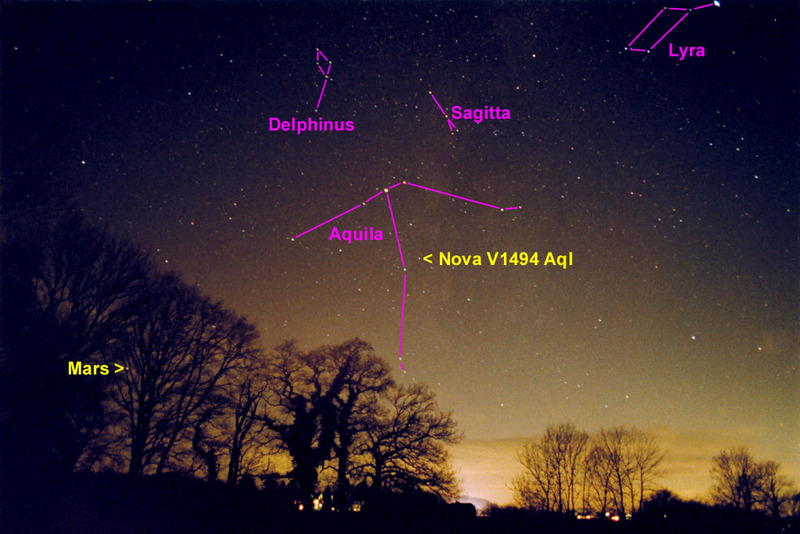 Opis: On December 1st, experienced observers patroling the night sky with binoculars noticed what seemed to be a new star in the constellation of Aquila (The Eagle). It wasn't really a new star though. A comparison with detailed skymaps revealed the amazing truth, there was a known star at that position in the sky ... its brightness had simply increased by about 70,000 times. 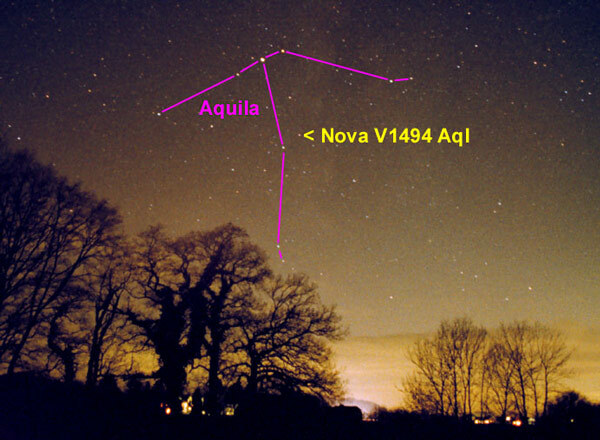 The star, now fondly known to variable star observers as Nova V1494 Aquilae, continued to grow brighter for several days, becoming easily visible to the unaided eye before starting to slowly fade away. Its position within the constellation is indicated on this wide-angle picture taken on December 4th, near the time it was brightest. What would cause a star to undergo such a cataclysmic change? This "new star" appears to be a classical nova. Classical novae are thought to be interacting binary star systems in which one of the pair is a dense, hot white dwarf. Material from the companion falls onto the surface of the white dwarf, building up until it triggers a thermonuclear blast. A stunning increase in brightness and an expanding shell of debris result - but the binary system is likely not destroyed! Classical novae are believed to recur as the flow of material resumes and produces another outburst in perhaps hundreds of years time.